One of the next actions as part of our Freedom to Ride campaign is to start to flesh out our proposed Bristol Cycling Network that we are working on with Bristol City Council. We are looking at some specific issues and routes that need addressing in order to generate debate and come up with some plans that can be progressed with the Council so that we have initial plans for as and when further funding is made available. Our Infrastructure Action Group is beavering away at this and one of the first proposals to emerge is an old chestnut – Clifton Triangle – an area that we had hoped to resolve as part GBBN and previously with other schemes. Adam, one of the Group’s members, has put some ideas together that very quickly lit up the “twitter-sphere” and featured on BBC Radio Bristol’s Steve le Fevre programme this morning at about 8am and are also being picked up by Jack FM this afternoon, as well as being featured in Bristol Post. These plans are in their early stages and that is the best time to start the debate and get people involved. Currently there are many problems in the area when walking. It’s loud, unpleasant, with narrow crowded pavement and a wide road full of roaring traffic. When cycling it’s even worse, a junction only for the bold! Can you imagine a child cycling to school from Whiteladies Road all the way around to Jacob’s Well Road? A grandparent cycling from Park Row to the museum? There’s so many problems we made another map! Modify the existing roads to necessitate a minimum of work so that it can be created and tested easily and cheaply, so if it doesn’t work it can be reversed. 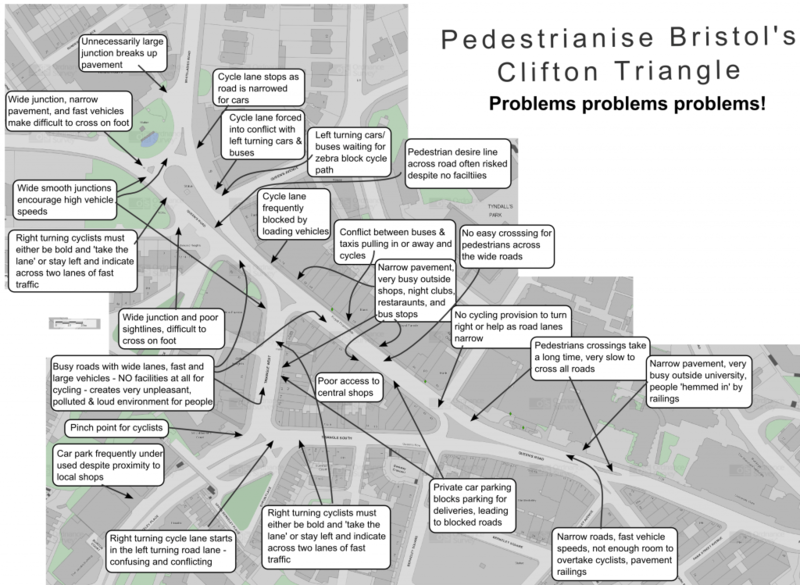 Improve overall traffic by creating decent cycling and pedestrian routes through a difficult and unpleasant part of Bristol. Inspiration came from a recent TED talk by Janette Sadik-Khan, New York City transport boss, who describes how she pedestrianised Times Square in New York in a similar plan to mine. As you can see this was done cheaply and easily as a trial, using paint, bollards, and even folding garden chairs! We need to create more places where people can walk and live, eat and shop. Meet the Bristol Cycling Manifesto’s demands and create a cycling network to a high standard, so all aged from 8 to 80 can cycle around the city. We need to create transport solutions that suit the needs of all it’s people, fairly. If you agree, talk about it, tell your friends, ask the Bristol Cycle Campaign to fix a junction you know, and sign the petition. This post is the start of a new vision of a Bristol for people, your voice can make it happen. More plans will come, follow Bristol Cycling Campaign for news.